By GM concept, it is presumed, the center of the planet emits a GM code vibration frequency. 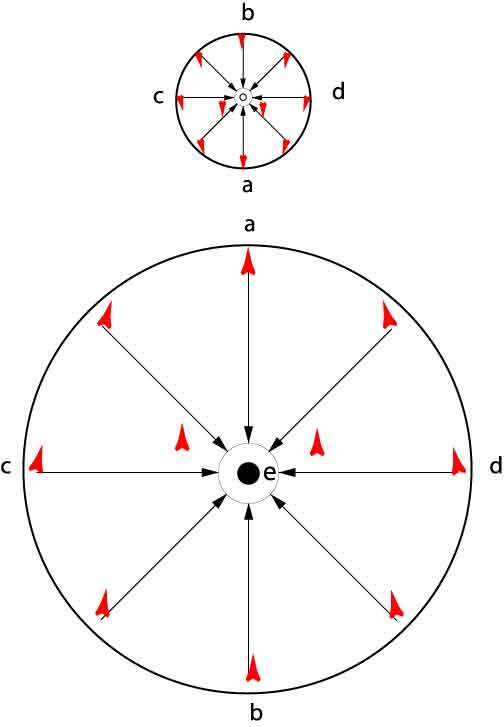 This is the direction all the atoms align their main GM directional power to, because the center, emits the strongest signal. That thought is based on the presumption, that the core of a planet should have the heaviest mass, composed of the heaviest atoms, hence creating the strongest signal, to which the GM, respond. (A center planet pressure theory by GTM. must be considered.) In addition, the entire mass of the planet is therefore centre seeking, again this as a whole, amplifies the GM signal according to the planets size and make up. That as a unit dictates the gravitational power ratio, of a planet. On this basis of thought, the mass propellant ship was designed and a patent applied for in 1986. If we talk about GM of atoms centre earth directed by this concept, see FIG. 6, (GM 2001) 3. We can imagine this (three dimensional) centre earth directed by the arrows. If we want to understand GM inner solar system attraction, we have to look at FIG. 7. This shows by arrows heads indicated, a planets attraction function for better understanding. Lets presume the process in quarter sectors not considering vector forces. Dual GM duties, which means center earth attraction and planetary attraction at sector a of the sun and sector a of the earth, not taking into account the attraction between the sun and the earth in sector, positions c and d. Position b on sun and earth look GM passive, (no change) only gravity center planetary bodies directed. This is the simple version but there is more to be considered. The atoms in section a, are solar system GM power active, according to the square of the distance between their bodies. If centre earth seeking GM would be slightly diminished, in sector a in line e-a (by stellar gravity bundles), the atoms in sector b line b-e then, contribute to the solar system attraction, without having to provide in principle extra bundles of stellar GM. If the centre earth seeking GM were slightly augmented, sector b line b-e, that would show somewhat, the basic mechanics in this concept. To explain GM inter planetary attraction more specific, it would look something like FIG. 8. The red arrows are solar system attraction GM bundles; the black arrows are centre earth directed GM bundles. Some atoms dont have to change direction for extra solar system GM as in sector b line b-e.
Sector a line e-a has to provide opposite to centre planet stellar GM bundles. 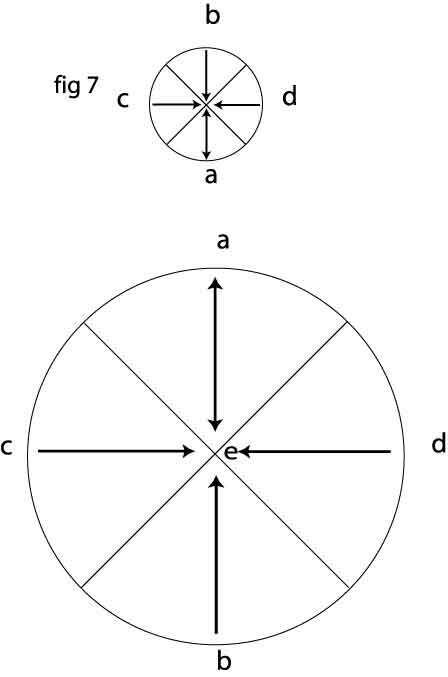 Sector c and d line d-e and c-e provide stellar GB bundles at an angle of 90°, all other lines in a suitable angle governed by the position of the star to the direction of the orbiting from planet or visa versa. (As shown in Fig. 8) Section b-e (as said before) may assist in directly contributing and may not have to contribute extra GM bundles at all.